It’s the return of Björk to Toronto, starring Björk. And maybe you. But definitely Björk. Inez van Lamsweerde & Vinoodh MatadinIt might seem like Björk doesn’t tour much anymore – after all, it’s been nearly five years since she was last here headlining V Fest 2007 in support of Volta, but that was actually her last album before 2011’s Biophilia. So besides the fact that she’s been working at a slower pace than when the ’90s triumvirate of Debut/Post/Homogenic made her one of the most unconventional pop stars of Alternative Nation, there’s also the demands of raising a family, and anyways – if you could live here just watching TED talks or in hotels on the road watching ESPN, where would you rather hang out? 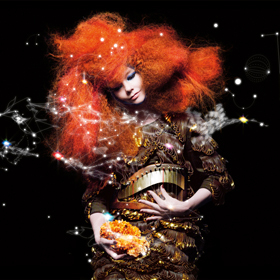 In any case, Biophilia initially came with an ambitious slate of live shows, but the preference for more intimate, in-the-round, month-long residencies over conventional shows limited the cities that could host her to the likes of New York, Paris, and Manchester and even if there were intentions of adding more cities, the need for vocal polyp surgery last Fall would have probably ixnayed those. All of which is to say, yes Björk has been away for a while but she’s not forgotten us – as I speculated last month, she is indeed making a stop between already-announced engagements at Ottawa Bluesfest and Pitchfork Festival, and will be at Echo Beach on July 16 with whatever wild, weird, and wonderful show she’s put together for this North American jaunt. Tickets for the show are $64.50 and $85.00 for VIP, but courtesy of LiveNation, I’ve got one pair of passes to the show to give away before the regular onsale happens this Thursday morning at 10AM. To enter, email me at contests@chromewaves.net with “I want to see Bjork” in the subject line and your full name in the body, and have that in to me by midnight, April 3. Yes, that’s tomorrow night. Winners will be informed before the general on-sale goes live. Titus Andronicus have announced a May 2 date at Lee’s Palace in support of last year’s Local Business. Yes they’ve already been through for that one and yes, they’ll probably be back yet again before all is said and done. And you know why? Because people keep going. Tickets for this show are $18.50 in advance. Australia’s Presets are coming back to town behind last year’s Pacifica with a date at The Danforth Music Hall on May 10, tickets $25 plus attendant fees. A PSA that the Marina & The Diamonds/Charli XCX show originally scheduled for May 23 at the Sound Academy has been moved to Echo Beach, a development that will probably be welcomed by everyone unless it rains, in which case it will be cursed. Noisey talks to Charli XCX about her debut album True Romance, due out April 15, and Consequence Of Sound has a stream of one of the new songs off of it. British rockers The Boxer Rebellion have announced a North American tour in support of their new album Promises, out May 14, and will be at The Opera House in Toronto on May 24, tickets $18.50. They talked to Billboard about what to expect from the new album. With their new album Ultramarine ready for an April 16 release, Young Galaxy have made a May 31 date at Lee’s Palace to celebrate its release, tickets $15. The Line Of Best Fit has an interview with the band. Marking the physical release of last Fall’s Heavyweight EP, Rachael Yamagata will be in town at The Mod Club on June 4 as part of her Dealbreaker Tour, tickets $16.50 in advance. Perhaps realizing that the royalties from the Veronica Mars movie won’t start rolling in for a while, The Dandy Warhols have announced a lace anniversary tour for the only record of theirs anyone ever really cared about and will play Thirteen Tales Of Urban Bohemia in its entirety at The Phoenix on June 5, tickets $32.50. Rancid will headline the Avenues and Alleways Fest at Echo Beach on June 12, featuring all manner of Rancid-approved punk bands. Tickets for that are $35 in advance. British soul-funk saviours The Heavy have made a return engagement in support of last year’s The Glorious Dead; they’ll be at The Phoenix on June 19, tickets $17.50. Barely making himself scarce after being pretty much everywhere during Canadian Musicfest, Mac DeMarco will be at The Hoxton on June 30, tickets $14. A second official batch of NXNE acts was announced last week, with notable names including punk vets Social Distortion, who will be headlining the free Yonge-Dundas Square show on the Thursday night, confirmation of Big Boi doing the same on the Sunday, Coeur de Pirate making her first appearance post-motherhood, and Fucked Up doing their thing at The Horseshoe on the Saturday night. Also likely to be a hot ticket is Montreal’s Majical Cloudz, recently signed to Matador for the May 21 release of Impersonator. In addition to the NXNE appearance, he/they’ll be at The Great Hall on May 13 supporting Youth Lagoon. And if you’re interested in all the artists officially announced for NXNE thus far, hit the artists page. Some more additions to Toronto Urban Roots Fest of a decidedly domestic nature; joining a host of others at Garrison Common from July 4 to 7 will be Toronto twang-duo Whitehorse and ascendant Vancouver singer-songwriter Hannah Georgas. The former is playing on the Sunday, July 7, the latter on the Saturday, July 6. Noel Gallagher-approved, One Direction-baiting, Olympic-soundtracking, chart-topping English singer-songwriter Jake Bugg will make his Toronto debut at The Mod Club on August 3, tickets $15. Ladyhawkemusic.comNME has an interview with Pip Brown, aka New Zealand synth-pop star Ladyhawke, who is getting closer and closer to officially following up her super-tasty 2008 self-titled debut. Anxiety is set for a March 20 release and according to Brown, is synth-free and much more guitar-heavy in the style of ’90s bands like Blur and Pixies; well, at least she’s keeping things retro. There’s no preview track or advance single yet – “Black, White and Blue” will be released on February 19 – so at the moment, the only taste of Anxiety available is the trailer below, and I dunno, don’t I hear synths in there? Hmm. Oh, and if the trailer doesn’t work in the streaming player thing, click through on it to watch directly on YouTube. There’s also a collaboration with Tim Burgess of The Charlatans entitled “Just One Kiss” that will see the light of day at some point, though it doesn’t appear to be on the official tracklist so maybe it will be a non-album single. NME also talked to Burgess late last year about that tune. The new single from Loney Dear’s gorgeous Hall Music is available to both watch and download. Do both. The Line Of Best Fit has a video session with First Aid Kit as they ramp up to the January 24 release of The Lion’s Roar. They’ll play The Great Hall on April 4. Having had to cancel their North American tour last Fall, The Boxer Rebellion are trying again and have set a course that includes a May 2 date at The Mod Club, tickets $18.50. The Big Takeover talks to Greg Hughes of Still Corners. Why should you care who Lightships is? Because it’s the solo project of Teenage Fanclub’s Gerard Love. There’s details on the project at the Fannies website and there’s a video for the first single from the debut album Electric Cable, out April 2. Artrocker reports that Suede are releasing a live CD/DVD of their reunion show at the Royal Albert Hall last Spring, set for release on the second anniversary of the show on March 24. And while Brett Anderson confirmed to BBC6 that the band are recording new material, he also reiterated his position that unless the new songs are up to snuff, they won’t see the light of day. Drowned In Sound interviews The Horrors. Sky Larkin have posted an update on what they’ve been up to lately – hoping for something new in 2012 – and also posted the final video they’ll be releasing from 2010’s Kaleide. The National Post chats with Milo Cordell of The Big Pink while news.com.au gets some of Robbie Furze’s time. We knew it was called Valentina and would be arriving in March, but The Wedding Present have finally announced details about the new record, which will be out as of March 20 – just in time for their March 25 visit to The Horseshoe.